Our inflatable 3D Bounce and Slide Combo units are so incredibly awesome! These pictures don't do them justice. 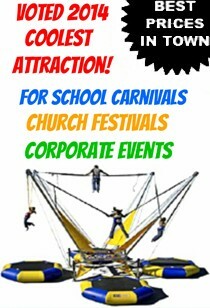 They will turn any birthday party or event into the hit of the party! 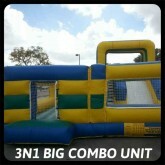 These 3D Bounce and Slide combo units are a major upgrade from the original inflatable bounce house rental. 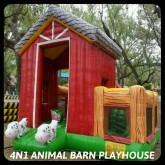 These offer a bouncing and climbing section, some offer a basketball hoop, pop up logs and obstacle courses. There simply amazing and the ultimate ecqonomical way to have some entertainment for the kids at a party! 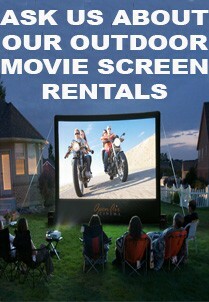 Bounce & Slide Rentals There are 8 products. 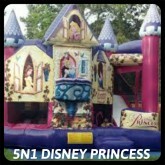 The Disney Princess 5 in 1 Combo is sure to make any princess party theme amazing! Have daddy's little girl play with all her friends as they bond with Belle, Snow White, Cinderella, and Sleeping Beauty! 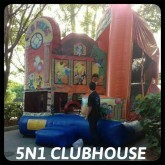 Everything about the Club House 5 in 1 combo screams party over here as the kids let their imaginations run wild in this 5 activity bounce house. 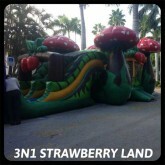 Our Strawberry Land 3N1 Combo will transform any Strawberry Shortcake Theme Party into a Magical Place your kids will enjoy playing in. 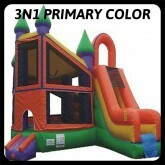 The Primary Color 3 in 1 is our most basic of our bounce and slide combo units. Very popular with church festivals and school carnivals that are looking for theme;ess inflatables to match their carnival theme! 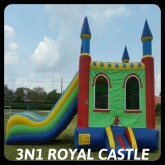 Who would like to the the king or queen of this royal castle 3 in 1 combo unit? Bounce Climb and slide qqrqight into the kings catle! 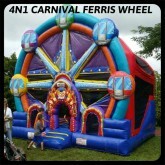 Inflatable Carnival Ferris Wheel Our Newest addition to our Carnival Rides Selection. A beautiful and fun inflatable Carnival Ferris Wheel Combo!